Late Summer, early Autumn is a particularly good time of year to review, regroup, perfect and plan for next year’s even more glorious gardens. As the gardening year energetically marches through its last crescendos of Summer displays, and the ravaging storms of late September and October subside, a bucolic calm of misty late Autumn days approaches. These last days of Summer are so important – to stand back and take stock of successes, to log the position of key perennial plant players that will soon retreat out of sight, and to consider the seasonal pace of every focal point, border, open space and closed space. Speaking of open spaces, the vast majority of large domestic gardens in the UK consist of a yawning expanse of lawn, circled by shrubby borders. Great for a game of footie but a little lacking in character and inspiration? The phrase ‘Garden rooms’ has become well-worn over the years and for good reason. If there is space then newly created, more manageable, interconnecting areas can bring a variety of possibilities to play with – shifting shapes, colours, textures and ultimately, more intensely gratifying planting combinations in plotted pockets small enough to concentrate the mind and appreciation. To lose oneself in the exploration and enjoyment of such a carefully portioned place can be heaven. Back to earth, in practical terms, noting what you have and where, as perennials and bulbs retreat beneath, helps hugely with winter re-organising. Visiting notable gardens can really help with ideas on how to lead garden goers around and through divided areas, and also how to slow them to a contemplative stop. There’s also plenty of inspiration for your garden planning over on Pinterest. At the ideas stage, make sure to mark out your dividing garden fences with sand and or ropes and consider how high your planting screens may be in relation to the individual area’s new aspect. Where will the shade fall when the sun’s at its lowest in the winter and at its highest in the summer? This could affect your planting choices. Any fencing, however high or low, needs to be sturdy, long-lasting and weather-proof. Garden Requisites’ metal trellis fencing is an attractive solution, interlocking, high quality, handcrafted English wirework inspired by Victorian designs. Fence tops can be arched or straight or arched and the metalwork is zinc galvanised for long life. The metal fencing can also be painted in muted colours for a really smart finish. See our lattice trellis fencing Pinterest board for a better idea of fences in situ. For a more palatial spatial feel in the garden, lead plants and visitors through the curves, arcs and flourishes of some of Garden Requisites grander metal trellis structures. 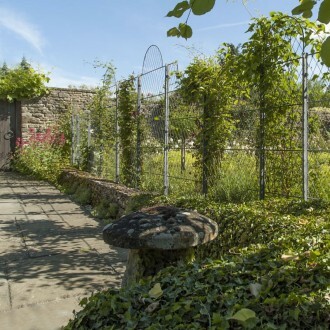 Trellis fencing can be teamed with graceful trellis arches, gated or open to invite visitors through cascading, heavily scented rose bowers, maybe through fruit arbours and multiple botanically diverse spaces to a celebratory centre-piece gazebo. For more potential plant swooning, see some truly inspiring garden arches. If you plan for your fencing and focal garden structures to be ordered and installed in the winter months, you’ll be in pole position for planting hardy climbers in early Spring, for a fuller effect in your first year of garden division. Sometimes these sorts of projects can seem daunting. If in doubt, root out a reputable, local Garden Designer (they don’t always cost the earth once you consider your time involved and cost of materials). If you’re happy going solo. Garden Requisites’ owner Hilary is also an ex-Garden Designer and often at the end of the phone on 01225 851 577 so feel free ask her opinion on space planning and installation ideas. On the other hand, if you are a Garden Designer, we speak your language!